Enchanting mountains and the magnificent Hardangerfjord encompass the charming Utne Hotel. 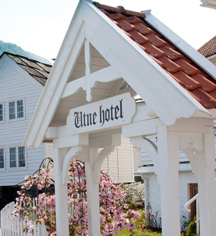 One of the oldest hotels in Norway, the iconic Utne Hotel opened its doors to guests in 1722. With its intricate decorative details and collection of antique treasures, entering the historic hotel is like living in a history book. Utne Hotel's founder was Officer Peder Larsson Børsem. After a decade of fighting, the Great Nordic War ended in 1720. Instead of pay, Larsson Børsem received a license from the king to run a guesthouse at Utne. He started with a living room, kitchen, hall, and one bedroom, which are still in use today. Almost 300 years later, guests still flock to Utne Hotel for its authenticity, inviting ambiance, to take in the sheer richness of its history, and also to enjoy the area's pure air, and fresh spring water. Hardanger, the town surrounding Utne Hotel, is known for gorgeous fruit trees blossoming in spring, and guests at Utne enjoy the area's renowned produce and cider. Whether visiting for a day, week or longer, guests at Utne Hotel enjoy quiet repose in this mountain oasis. Utne Hotel, a charter member of Historic Hotels Worldwide since 2012, dates back to 1722. 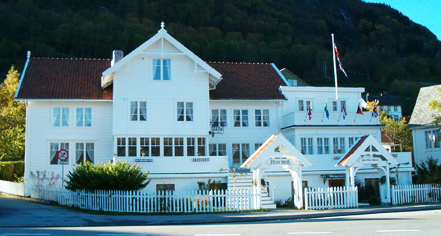 ‘Mother Utne’ (Torbjørg Utne, 1812–1903) is an icon of both Utne hotel as well as the tourism history in Hardanger. She offered guests high-quality care and attention for almost 70 years, from 1830 to 1900. Extra Person Fees: All older children or adults are charged NOK 395 per person per night for extra beds. Payment: Visa, MasterCard, Amex, and Bank Axept are accepted. Learn more about the History of Utne Hotel .